1Christian Faith Wallet card. These cards come in a range of designs and colours. On the reverse of each is a space to write a message to someone. Cards are made of flexible plastic and measure 8cm by 5cm. 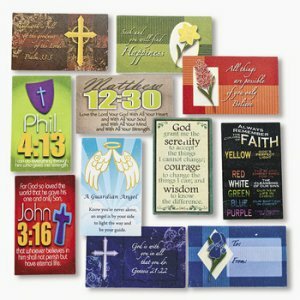 Ideal for giving out in churches or adding to cards as little gifts. What a great site!! So many little gifts and activities for our Sunday School. I wish I had found it earlier. Really pleased with these cards. Arrived quickly and liked the quality of the cards. Good and strong and flexible. Especially pleased with the cost.